It’s difficult to argue that any general market band has injected the Bible into its songs more than Rock & Roll Hall of Fame legends, U2. From the opening track of its 1981 sophomore release October to its 2017 album Songs of Experience the iconic Irish foursome has consistently gone back to its spiritual roots as former members of the Shalom Fellowship in Dublin. Four years later, U2 dedicated an entire song from Achtung Baby to Judas (one of the original 12 disciples) and his betrayal of Jesus. “Until The End of the World” begins with a scene from The Lord’s Supper (Matthew 26:17-30), continues in the Garden of Gethsemane where Jesus is betrayed (Matthew 26:36-56), and concludes with a guilt-ridden Judas taking his life (Matthew 27:3-5). 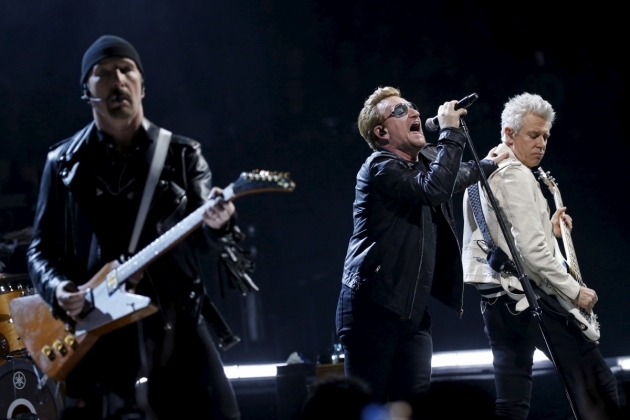 While three of its four members grew up around the Bible, lead singer and primary lyricist Bono is often credited for bringing its content into U2’s musical offerings. His love for the book of Psalms is especially apparent and has even impacted the band’s live performances in unique ways. Bono noted this in the 2016 documentary The Psalms, in which he was featured along with Eugene Peterson, author of The Message. “In the dressing room before a show, we would read the psalms as a band and then walk out into arenas and stadiums—the words igniting us, inspiring us,” Bono revealed. Bono explained his admiration in the introduction to the book Selections From the Book of Psalms. Dear Lord, we thank You for the Bible. We thank You for all the lessons we can learn from applying to all aspects of our life. In the Name of Jesus, Amen.